Syrian Democratic Forces have continued their advance on the town of Azaz in northern Aleppo province, a key Turkey-backed stronghold and supply point. 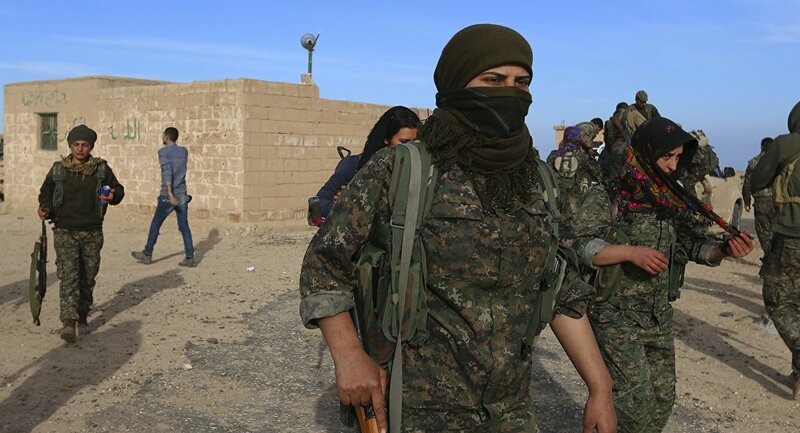 Syrian Democratic Forces (SDF) have continued their advance on the rebel stronghold of Azaz, where they are fighting Turkish-backed rebels, primarily from the al-Qaeda-affiliate al-Nusra Front and Ahrar al-Sham. "Turkey continues to cause massive artillery strikes on the positions of the YPG and Syrian Democratic Forces. The villages of Meryemin, Minnigh near Azaz and Afrin have been subjected to shelling. Civilians have suffered as a result of the bombing," YPG commander Firat Xelil told Sputnik Turkiye. Despite Turkish attacks, the SDF, composed primarily of the Kurdish People's Protection Units (YPG), and the Jaish al-Thuwar Syrian rebel group, have continued their advance against Turkish-backed Syrian rebels. "According to the latest information, 15 inhabitants of the area were injured to varying degrees of severity during the recent shelling. No YPG and SDF soldiers were wounded. SDF units have advanced 1.5 km toward the center of Azaz," Xelil told Sputnik Turkiye. According to the Anadolu news agency, Turkey is using Firtina self-propelled howitzers stationed in the border province of Kilis, and is aiming for Kurdish positions and the Menagh airbase, which the SDF has recently taken control over.